A few weeks back I was interviewed by Tim Binnall who runs the paranormal website "Binnall of America". The subject was, of course, the Loch Ness Monster. The interview ranged far and wide and we covered a lot of ground and it will hopefully inform people more about the creature. The interview can be found here for your listening consideration. I was discussing the subject "ex tempore" so any facts or figures you think are inaccurate we can correct here. I spotted an article by a Malcolm Robinson who writes on mysterious and paranormal subjects. This part looks at the Loch Ness Monster and although much of what he says is not new, he does include the transcript of an interview he did with Frank Searle some time in the 1970s or early 1980s. You can read it at this link and I make a few observation here. Firstly, Frank claimed 38 sightings of the monster which of course will be subject to some dispute by Nessie cryptozoologists. This is more than double the total claimed by such Nessie personalities as Alex Campbell and Winifred Cary. How many of these might have been genuine, I have no idea. Half he claimed to have a co-witness with him but Lieve Petin whom we mentioned previously said she never saw anything (as far as I can tell). If anyone did co-witness a sighting with Frank Searle, send me an email! The other interesting piece (which was also in his book) was the claimed sighting of some "young" Nessies in a river measuring about four feet long. Now one may scoff at this report but the general theme holds - if there is a breeding population (as opposed to a visiting creature or something paranormal) then there will be smaller, juvenile creatures. Another more plesiosaur like one is here, though I cannot be sure who painted it. Clearly, these smaller versions of Nessie have proven to be even more elusive than their adult counterparts as very few reports mention creatures of that size. However, this is to be expected for several reasons. The first is because of their small size and this means they are just harder to spot. Compare it to how rarely otters are seen at Loch Ness and then extrapolate that to an animal that rarely surfaces (Searle himself saw the creatures as water-breathers with surfacings being purely accidental as they pursued fish, etc). Secondly, apart from being difficult to spot because of their size, they are also less likely to break the surface. 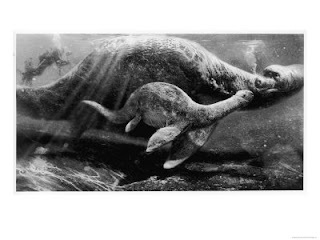 Thirdly, since we have no idea of the life-cycle of a Nessie, who knows whether they spend the first part of their lives remaining in the depths, out of the way of potential predators.